Turkish Earth observation satellite with a Korean-built imager, built for TUBITAK, the Turkish science research council and UZAY, the Space Technology Research Insitute in Ankara. Earth Observation satellite operated by T_BITAK-UZAY, Turkey. Launched 2011. Status: Operational 2011. First Launch: 2011-08-17. Last Launch: 2011-08-17. Number: 1 . Gross mass: 95 kg (209 lb). Apogee: 699 km (434 mi). Family: Earth. Country: Turkey. Launch Vehicles: Dnepr. 2011 August 17 - . 07:12 GMT - . Launch Site: Dombarovskiy. LV Family: R-36M. Launch Vehicle: Dnepr. RASAT - . Mass: 95 kg (209 lb). Nation: Turkey. Class: Earth. 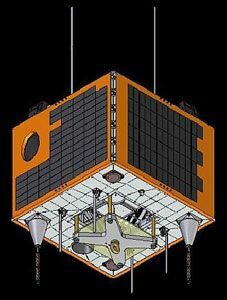 Type: Earth resources satellite. Spacecraft: RASAT. USAF Sat Cat: 37791 . COSPAR: 2011-044D. Apogee: 699 km (434 mi). Perigee: 666 km (413 mi). Inclination: 98.20 deg. Period: 98.40 min. Turkish Earth observation satellite with a Korean-built imager, built for TUBITAK, the Turkish science research council and UZAY, the Space Technology Research Insitute in Ankara..